Chorus is an effect you should always have in your tool box, whether you’re slamming out riffs, firing off precision-guided arpeggios, or weaving ambient sonic tapestries. You can use chorus to fatten up your sound at lower settings, add depth and fluidity at moderate settings, and go full on space age at extreme settings. How does it work? Chorus pedals double your signal and then delay the duplicate at a constantly varying rate—usually with an LFO, or low-frequency oscillator—before mixing it back into the original signal. Varying the duplicate signal’s delay time causes pitch shifting thanks to the Doppler effect. This pitch shifting mimics the slightly off-key sound created by a choir of singers—even though they’re singing the same piece of music at the same time, no one person is singing with exactly the same pitch and intonation as any of the others. And that’s why we call it chorus. Guitar players first got their hands on the chorus effect in 1975 as a feature of Roland’s Jazz Chorus Amp. Pedal versions followed shortly after, but it wasn’t until the ’80s that chorus really found its place in popular music. Since then, artists from all over the stylistic map have embraced the effect, from Alex Lifeson and Andy Summers to Eddie Van Halen and Slash. 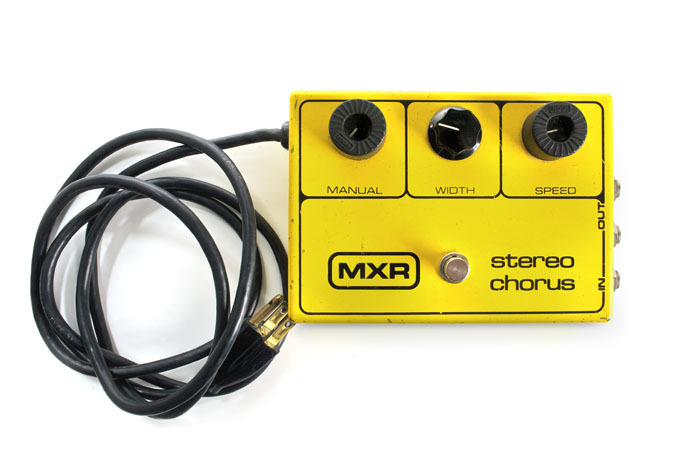 MXR® first entered the chorus market in 1980 with big, yellow, three-knob box simply called the Stereo Chorus. The original Stereo Chorus was all-around great sounding pedal, but its most defining feature was its Manual control. As with the MXR Flanger, the Stereo Chorus’ Manual control allowed players to adjust the effect’s delay time (the Speed control adjusted the oscillation rate). The Micro Chorus followed the Stereo Chorus in 1981. With a single Speed knob for straightforward operation, this pedal is to chorus what the Phase 90 is to phasing. While compact and easy to use, the Micro Chorus pours out volumes of rich, modulated shimmer with a hint of flange around the edges. A few years back, we re-introduced the Micro Chorus—along with the Micro Flanger—as a faithful reissue of the original circuit. The Stereo Chorus returned to the MXR line several years ago with a complete circuit overhaul. Today’s version has a very clean, modern sound with a very pronounced pitch shifting quality. Running on 18 volts, the Stereo Chorus now has a ton of headroom. The MXR team swapped out the Manual control for an Intensity control—essentially a wet/dry mix—and added Bass and Treble EQ controls and a Bass Filter switch to remove the effect from low end frequencies. 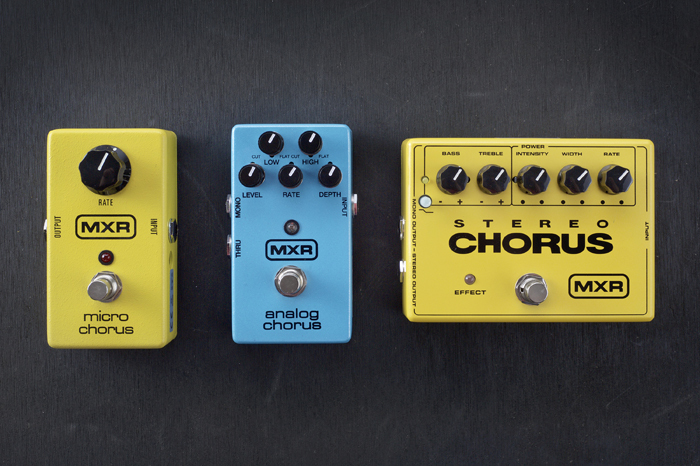 The Analog Chorus is MXR’s take on the classic “dirty” analog chorus sound. Compared to the Stereo Chorus, its pitch shifting quality is more subtle, but with lower headroom, this pedal breaks up nicely when pushed with a little extra gain. Like the Stereo Chorus, the Analog Chorus has controls to tweak the wet/dry mix and shape the high and low end of the chorus effect. The Analog Chorus is a natural fit for hard rock and metal—just ask Slash and Rise Against’s Zach Blair—but its tweakability makes it an incredibly versatile pedal. How you use a chorus pedal depends on your needs as a guitar player or bass player. Here’s a few tips to get the most out of the effect without overdoing it. First, have an idea of why you want to add chorus to a song. Adding ambience and movement to a slow piece, making your solo stand out, thickening up strummed passages—these are all good reasons to use a chorus pedal. When you decide how you want to use your chorus pedal in a song, experiment with different playing styles and control settings. You’ll have to play differently with a subtle tone thickening sound dialed in than you would with a spectral, ambient sound or with an all-out deluge of swirling oscillation. Finally, try combining chorus with other effects. Experiment. Overdrives, distortions, and delays are a great place to start. If you want to take your modulation game to the next level, try adding a flanger or a phaser to the mix. As for the order of effects, there’s obviously no hard and fast rules, but most guitar players willx tell you to place your chorus pedal after the effect you’re pairing it with. This allows the chorus effect to fully develop and work its magic on the rest of the signal.